Did Twitter Have a Role in the 2012 Election? Can a social media application site such as twitter change a voter's? People were calling the 2012 Election the "Twitter Election" Throughout the course of the 2012 election there was over 400 million tweets each day that had either had Obama's or Romney's name in the tweet. both candidates use twitter in their strategy to try to win the election. Mitt Romney strategy was to drive dialogue, mobilize supporters, and shift voter attitudes throughout the race. 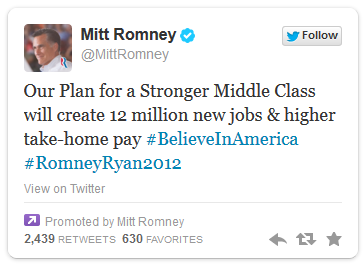 Mitt Romney had a idea that using a platform such as Twitter would serve as the candidate’s online voice. "If you come down with a case of Romnesia and you can't seem to remember the policies that are still on your website, here is the good news: Obamacare covers pre-existing conditions," Obama said. Once Obama said that over twitter Romnesia was being hash-tagged all over Twitter. Peter Hoekstra a Congressmen for the republican had a seriers of tweets that got him in a bit of trouble. His first tweet read "Just landed in Baghdad" later on he said "moved into the green zone by helicopter Iraqi flag now over palace. Headed to new US embassy appears calmer less chaotic then previous here". This was very dangerous of what Peter Hoekstra did because it was showing where exactly where his location was and if a terrorist read his tweets who will ever know what they would do.